ZHUKOVSKY (Moscow Region), July 19. /TASS/. 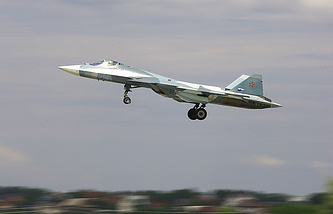 The pre-production batch of T-50 fifth-generation fighter jets will equal 12 planes, United Aircraft Corporation (UAC) Head Yuri Slyusar said at the MAKS-2017 international airshow on Wednesday. "From the very outset, we proceeded from the fact that the final decision had been made on 12 planes," he said.